Fusion Summon 1 Fusion Monster from your Extra Deck that lists a "Cyber Dragon" monster as material, by shuffling the Fusion Materials listed on it into the Deck, from among your cards on the field and/or your face-up banished cards, but monsters you control cannot attack for the rest of this turn, except that Fusion Summoned monster. You can only activate 1 "Cyberload Fusion" per turn. 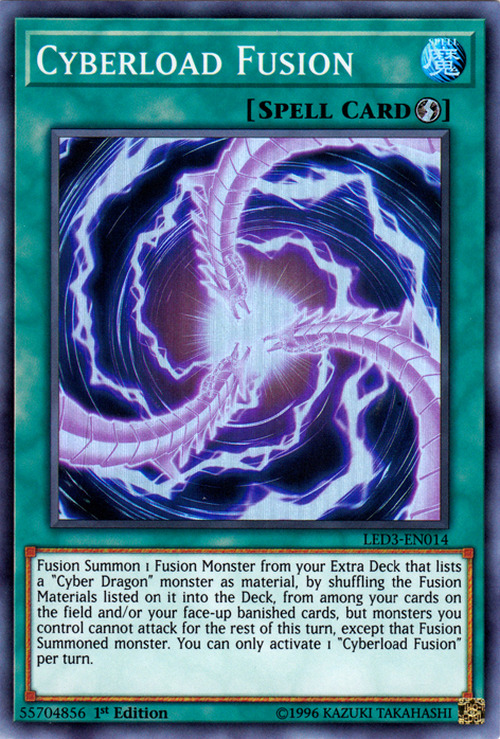 This card could be seen as a LIGHT counterpart to Overload Fusion. This is supported by the synergy this card has with the latter, with Overload Fusion summoning DARK Machine Fusion Monsters by banishing them from the field or GY and Cyberload Fusion shuffling them back into the deck from the field or Banished Zone.